Well, this wasn't quite the idea of a tostada that I had in mind...but the recipe was great, filling, and flavorful nonetheless. This ended up being eaten more like a burrito (tostadas are smaller and served on flat, crunchy tortilla shells), but the filling and toppings did not disappoint. 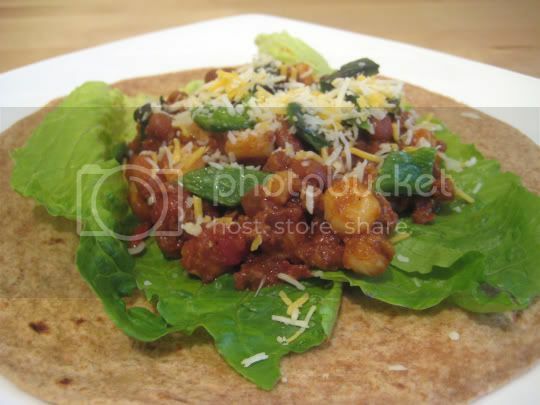 Soy ground meat, pinto beans, salsa, and hominy are cooked together (with a little lime juice and chili powder), placed on a lettuce-lined tortilla, and topped with shredded cheese and roasted peppers. The filling was delicious: very Tex-Mex, very savory, and the perfect amount of seasoning. It would be delicious atop nachos, minus the hominy. The roasted peppers (the recipe suggested poblano, but I used pasilla) added a tiny bit of heat and a nice bitterness and punch to contrast the saltiness of the filling. I'd probably use shredded lettuce next time, as the green leaf didn't really do much for me, and is not used for your standard tostadas. Make again? Definitely. This was a great filling meal with reliable leftovers.